I was rummaging through my makeup dresser today trying to figure out what I should write for you guys today and I realized that even though I love my high end products I have a ton of drugstore favourites that I just can’t live without. I thought I’d share with all of you these beauty related favourites that won’t break the bank. First I’m going to talk about my facial cleanser. I use two different ones morning and night but after relentless searching I can say that so far Cetaphil really has to be the best. I find that it cleans well without making me feel tight and dry after, I have noticed some of my spots went down dramatically after I implemented this into my skincare routine. It really is a dermatologist recommended product and I can see why. I think this cost me $11.99 at my local Shoppers Drug Mart but I’m sure you can find it loads of other places for cheaper as well. Definitely check it out if you’re looking for a drugstore alternative to a gentle face cleanser! Next I’ll talk about blushes and for $2.99 I really think it is a must have for people on a budget. These Wet n Wild color icon blushes are just as pigmented and creamy as the eye shadow quads. This colour is in heather silk and I think it’s a gorgeous deep pink. The packaging is a beat cheap and as you can see I did drop it and the blush did chip but for the price you can’t really go wrong. I barely need to touch my brush to the pan in order for me to pick up colour. I think it’s a great product especially for the price. Cream eye shadows have become a huge thing in the makeup world and I think Maybelline really got it done right with these Color Tattoo 24hr Eyeshadow. This colour is in Inked pink and it’s from their Metal collection (I’m not sure if it is still available). They go on silky smooth and mine is still great and I've had it for a super long time. I typically still use a primer underneath because my eyelids are super oily but I do find they last all day. These are great as a base or even as just a quick lid colour if you’re in a rush. Keeping with the theme of eye products, the NYX jumbo eye pencils are like my most used eye products I have to say. I almost always use them as a base unless I’m using a cream shadow. Milk is the one shown here and it probably has to be my favourite because the white is just the perfect base for any colour to pop on top of. I want to go and buy the whole set of them because I think they’re just incredible. Lastly, this has probably got to be the cheapest mascara I've ever bought and it’s actually become one of my favorites recently. One of my favourite Youtube Gurus EmilyNoel83 (also known as Beauty Broadcast on her blog) has raved about the essence I <3 Extreme crazy volume mascara so I figured I had to go out and try it. She was right; my lashes look extremely thick and even long. This mascara holds a curl really well and I really enjoy this mascara. 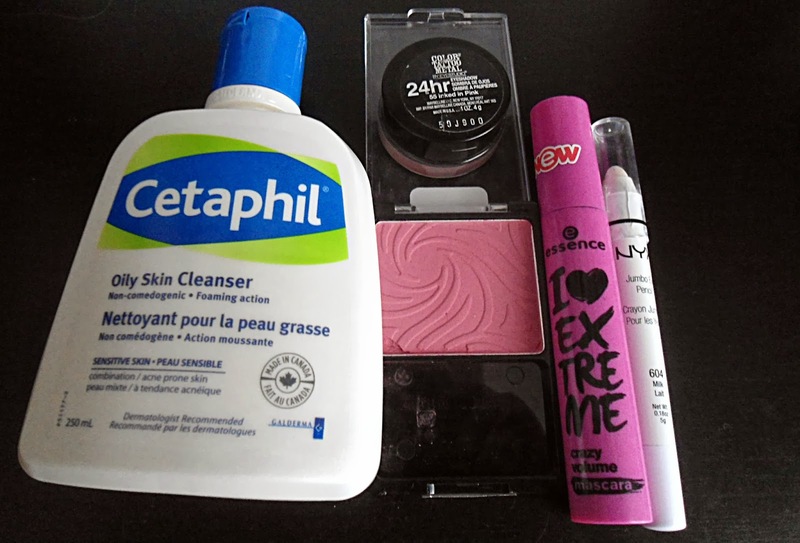 Are any of these your favourites and if not what are your favourite drugstore products? Don't forget to follow me on Google Friend Connect to keep up with all my posts! Cetaphil facial cleanser and NYX jumbo are my all time favourites too!!! inked in pink is my go to shadow!! mine dried up need a new one! !